EVERYONE knows there are two images of Christmas. There’s the fluffy one the advertisers try to sell us, all chunky jumpers and beaming smiles. Then there’s that notorious party pooper called reality. For many, it’s the season to be sniping at each other. But I doubt anyone’s Yuletide is as colourful or as memorable as this one, vividly and at times hilariously captured by the prolific playwright Alan Ayckbourn and a cast expertly led by director John Chidgey, who manages to make everyone feel invited to the at times chaotic seasonal celebrations. Let’s just say a typical family gathering, a gathering that will be repeated thousands of times up and down the land in a month’s time, turns out to be far from typical. Ayckbourn writes about a world I don’t live in. But thanks to? Chidgey and his charges I felt totally immersed in it. This is a major comedy triumph for this theatre, with each performance characterised by impeccable comic timing. I particularly enjoyed Bill Platt as the hopeless puppeteer and equally clueless medic Bernard, Victoria Evans as the flirty Belinda and Peter Ruddick as the only eligible guest, Clive. Gary Collins ensures you wouldn’t want to meet the barking Harvey on a dark night. That said, I? don’t like singling out individual performances because there aren’t any weak ones, with the company gelling quite brilliantly. Make sure you don’t miss this early Christmas present from the Garrick – with plenty of ho, ho, ho. CHRISTMAS should be a time of peace and good will. 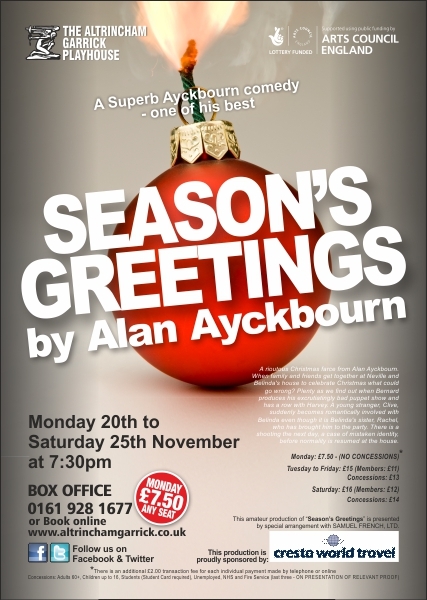 In Alan Ayckbourn?s play, Season?s Greetings, written in 1980, well directed by John Chidgey and performed at Altrincham Garrick Playhouse, this is not the case. The family and friends of Neville and Belinda Bunker have gathered for three days of Yuletide celebration. Sadly, familiarity breeds contempt. Neville?s inebriated sister, Phyllis (Tracy Burns) and her puppet-obsessed husband, Bernard (Bill Platt) are there as he prepares for his annual show. In one of the funniest scenes, it turns out to be a disaster yet indicates Bill Platt?s versatility. Among the guests is Clive (Peter Ruddick) whom Belinda finds irresistibly attractive because he writes. Neville?s uncle, Harvey, is a security guard who takes his job so seriously that he carries a knife strapped to his calf. Played outstandingly by Gary Collins, he works his evil wherever he can. On one amusing occasion, a couple embracing under the Christmas tree are halted by the sound of a mechanical toy. The protagonists, Neville and Belinda, are portrayed well by Barry Spencer and Victoria Evans. Belinda obviously has no time for her husband. At the end, they are the last on stage. This play is not easy since it involves many different moves and complicated relationships. Well done Dan Ferguson who stepped in at short notice to play Eddie. A Superb Ayckbourn comedy – one of his best! A riotous Christmas farce from Alan Ayckbourn. When family and friends get together at Neville and Belinda’s house to celebrate Christmas what could go wrong? Plenty as we find out when Bernard produces his excruciatingly bad puppet show and has a row with Harvey. A young stranger, Clive, suddenly becomes romantically involved with Belinda even though it is Belinda’s sister, Rachel, who has brought him to the party. There is a shooting the next day, a case of mistaken identity, before normality is resumed at the house. This amateur production of ?Season’s Greetings? is presented by special arrangement with SAMUEL FRENCH LTD.